Thread by @Daithi_Kyme1: "CORRUPTION EXPECTATIONS vs REALITY 1/ Recently UK MPs received a pay rise. This pay rise was set by the Independent Parliamentary Standards […]"
1/ Recently UK MPs received a pay rise. This pay rise was set by the Independent Parliamentary Standards Authority (IPSA). This is an annual adjustment, which came into effect on 01 April 2019. Salaries increased from £77,379 to £79,568. 2/ This rise of £2,089 was well above the 1.8% rate of inflation. With this being an annual increase one can see MPs wages exceed £80000 next year. 3/ Please remember expenses will also be sought and housing provided to certain MPs fulfilling the criteria, although this has been abused in the past. 4/ To many of us this increase in pay was a shock, indeed it turned madness into reason. The ‘reason’ was most people perceive the figure of 2.7% above the rate of inflation as a small percentage. 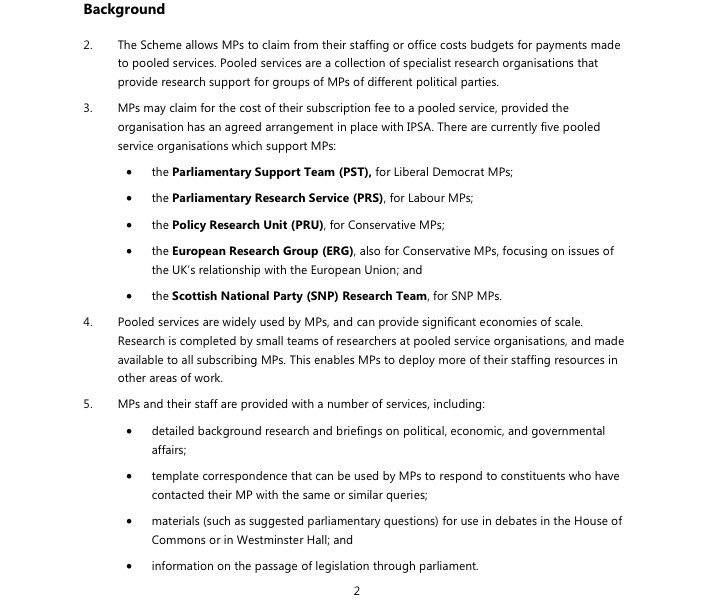 5/ However, staff working for the aforementioned MPs were not even considered by the IPSA, hence some MP’s backed over 100 staff members who complained to the Parliamentary Watchdog. 7/ One has to ask the question “Are MPs, at present, worth the aforementioned pay rise?”. Without a doubt the cross party group of MPs afforded the pay rise took the money. 8/ Due to their staffs concerns, and public outrage, the Labour & Cooperative MP for Stoke-on-Trent, one Gareth Snell wrote to Ruth Evans, the Chair of IPSA regarding staff pay. 9/ For those reading, Gareth Snell entered Parliament in 2017, representing Stoke-on-Trent. He was re-elected on 08 June 2017. His ‘concern’ was justified, after all Parliamentary staff work hard, their 1.5% for the 2019-20 financial year would hardly justify a living wage. 10/ His concern letter and Tweet, highlighting this pay disparity was welcomed by many. Sadly, he made the silly mistake of insulting women, insulting them in such a way that his party leader should have taken firm action, according to all those concerned. 11/ Indeed, comments can hurt, offend a whole gender base and this is not acceptable on a social media platform or in the workplace. It is the 21st century and as we all know...It is a right and not a privilege to work in a safe and dignified environment. 12/ Bryan Sanderson - Chair of the Low Pay Commission (LPC) was pleased the government accepted their forecasts for the low pay adjustments for 2019. Those over 25 were to receive a 4.9% rise, thus making their living wage £8.21 per hour. 13/ Younger workers would receive a rise ‘above inflation’. The forecast for 2020 is £8.62 for over 25’s. 14/ We often hear a great deal about the pay disparity between men and women, or those who sexually identify as they choose. This has included prominent actors, TV presenters, radio, those working in business etc. 15/ If one was to do the same job, to the same standards...no pay disparity should exist. 16/ Another factor, hardly ever considered, is the pay disparity between MPs, at all levels, and those that put them in such a privileged position ie the hard working public surviving on such low wages, living hand to mouth in, what is essentially, a rich country. 17/ Food Banks are now commonplace, areas of the UK are deprived in so many ways, be it housing, rail networks, health, effective medication...and I for one am simply aghast that female sanitary product poverty exists at all! 18/ It beggars the question “Are some MPs and Lords worth the money?”...such a similar question to the one relating to the recent pay rise. 19/ With just those examples one has to ask “Who is making the money?”. So without further ado...we need to start at the ‘top’ of the UK political spectrum ie the current Prime Minister. 20/ Back office parliamentary staff will be working hard, but with the EU and UK government now pushing Brexit back until the 31 October 2019, more work will be required. Fear and uncertainty already exist, yet again this will have an impact on the country as a whole. 21/ However, I would rather the public express their concerns, Although one cannot withdraw their consent Individually or evade the weight of the law, it isn’t called ‘policing by consent’ for nothing, as opposed to powers of a state. 23/ On becoming the Prime Minister of the UK The Capital Group issued a statement in relation to her husband - Philip John May. In the 21st century, with most people having near real-time news, naturally one wished to know who he was. 24/ Having received a degree in history, in the 70’s, Philip John May began work in the financial sector. He was a Fund Manager for de Zoete & Bevan, Prudential Portfolio Managers and Deutsche Asset Management. 25/ He has canvassed voters for his wife, the 2017 Copeland by-election was an example and he supports his wife in her Maidenhead constituency. 26/ Apparently, he does not advise the PM in an ‘official capacity’ but is reported to be her ‘most trusted advisor.’ This goes against the comments made by her Chief of Staff! 27/ He consulted his wife regarding the 2017 snap election. Most will remember their ‘walk’. 29/ It should be noted that Philip John May was named in The Panama Papers in 2016. These papers showed it was pointless trying to lie when there was nothing else one could hide. 30/ The Capital Group is a US company that controls $1.4 Trillion in assets. Capital Group’s portfolio includes JP Morgan Chase, ($7bn) Philip Morris International ($9bn), McDonald’s ($5bn) they also have significant investments in Amazon and Starbucks. 31/ Selling their wares is not a crime, but I’m sure most would agree, these companies’ tax avoidance scams are questionable to say the least. 32/ Since 2009, the Capital Group declared a turnover of £467 million, but declared losses of £125 million, as we know...turnover does not mean profit. 33/ What was very odd, if one was to research the money is despite this being a huge business failure, in the same period Mr May and other Capital Group directors decided to award themselves a bonus, that being - £43 million in salaries, pensions and other benefits. 34/ “How very odd!”...one could say. Certainly, with so many iconic shops and businesses closing or going into administration, it so odd that directors can receive such vast amounts. These amounts were given without the company actually turning over a profit. 35/ Like any commodity, share prices rise and fall, investors want a profit. During wars the share prices will tend to rise eg Syria. I won’t get involved in the ethical aspect of arms discussions...for obvious reasons. 36/ The Capital group are also heavily invested in the production of cannabis-derived medicines, these include Sativex and Epidiolex to name but two. 37/ However, the vastly inflated prices mean that the company turns a healthy profit, a profit in countries allowed to treat their sick and those on the point of dying. 38/ Morally, I find this repugnant. It is repugnant, as children needing such medicine, pain sufferers, cancer patients, MS sufferers etc living in the UK are still faced with an uphill battle to obtain cannabis-derived medication. 39/ In 2018 the Drugs Minister - Victoria Atkins - opposed the use of cannabis, naturally this didn’t sit well with many. Funnily enough her husband, the manager of British Sugar, was licensed to grow the aforementioned cannabis, in order to supply GW Pharmaceuticals. 41/ “The board see a huge opportunity here for AfriAg Global to help the UK increase its global market presence in this ... fast-growing sector,” David Lenigas, their Executive Chairman said those words. 43/ So we allow a joint (excuse the pun!) United Kingdom partner/South African company, along with others to profit from the misery of others. Yet countries such as Germany, Italy and Denmark already allow the prescription of cannabis-derived medication. 44/ Canada are also progressive, actually allowing the full legalisation of products. But the UK being the UK have wrapped the process in bureaucracy. One wonders why! 45/ The more sinister element to all this is the rise in knife crime within the UK. I have policed gangs, not only nationally, but in New Zealand. There are many ways to tackle the problem. 46/ It’s all well and good MPs jumping on the latest narrative, but remember they are paid well to listen and hopefully enhance the lives of those within their constituencies and deal with matters at a national level. 48/ The Capital Group’s Cayman Island funds/Bermuda investments are channelled through a South American agriculture company... of all things. Both are offshore jurisdictions, known for zero rates of tax. 50/ Two salient words here are “direct” and “blind”. Their investments are carried out through third-party companies. “Blind” investments are 'supposed' to be truly unseen. 51/ Politicians often place their personal assets in blind trusts to avoid public scrutiny and accusations of a conflict of interest. So if investing, the obvious question is..."What in?" 52/ Theresa May pursues policies that, some say, directly enrich her husband and herself, probably beyond their wildest dreams. Showing scant regard to questions regarding her tax returns, leaves a bad taste in ones mouth. 53/ Others have nightmares, fuelled by the fear of crime, poverty, random acts of violence, the lack of money to buy essential products to support their families...the list goes on and on. 54/ Healthy debate is needed and needed quickly, having just become a trainee grandfather in my 40’s, I look to the future with some degree of worry. 55/ The worry is not for me...I lost that, having been shot at, stabbed at, bricked, run over by a car, sustaining broken bones and seeing things I wouldn’t want anyone to see, I never actually thought I’d reach my late 40’s. 56/ I took orders well, sadly, like many people I did more than my fair share, this meant I missed out on a great deal, this included aspects of my daughter growing up and missing my wife whilst operational or training. 57/ But when your hardwired to care, it’s so very hard to walk away. 58/ Nobody is perfect, I know I’m not. But since my daughter gave birth, it’s hit me like a brick. I believe there’s a synergy between parent and child. I also believe someone was looking down on me at times. 59/ I was numb for a while, a creature of my given environment, living up to the expectations of those escalating their own privileges, rebranding my own work as their own. What they did with my work showed me more about human nature I suppose. For anyone reading this, thank you very much for doing so. 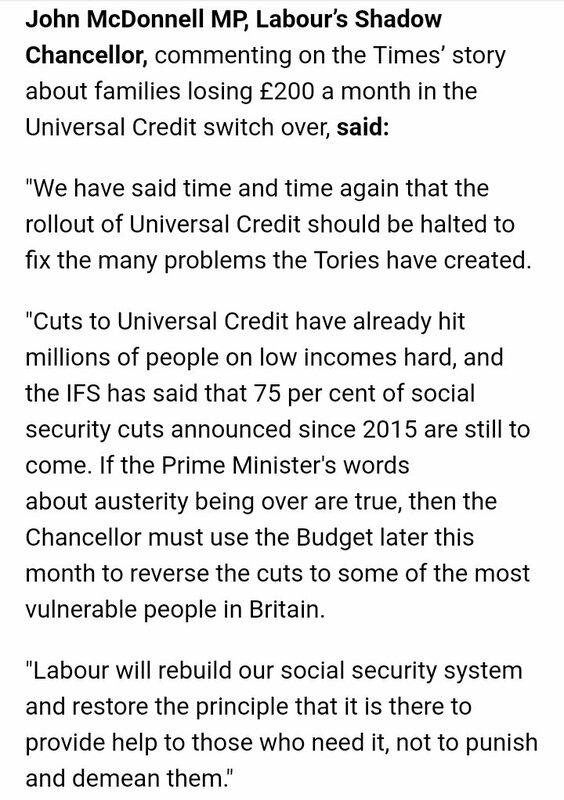 Labour's Shadow Chancellor, @johnmcdonnellMP, has released a statement regarding the sickening news that single parents and families will lose £200 per month under #UniversalCredit. His statement is in response to this. DAMNING study shows Universal Credit to blame for dramatic rise in foodbank use. @msmarbles2017 @acgrayling The SDP, Labour Party & Lib Dems also have ‘pooled services’ & the Tories also have the Policy Research Unit. Good evening all and trust we had a great day? Tonight promises to be great on #BreakingBarriers as I will be sharing insights on DRIVING YOURSELF CRAZY? @Antom_dapper @LanreAgboola1 @bofiasdaily @kayjavu @iamkingsmithA @OmosuleIdowu @mpbeads_fabrics @moradekedebbie @oyinloyesunday 1. What if the answer to one question could determine your contentment in life? •Claimed £20,000 in office expenses for work undertaken by a media relations and public affairs company. •Claimed around £10,000 for an annual report in 2007 on her performance as an MP, despite her former Commons researcher having never seen the report or worked on it. Dorries insisted that she had indeed published the report, placing a photograph of it on her blog.